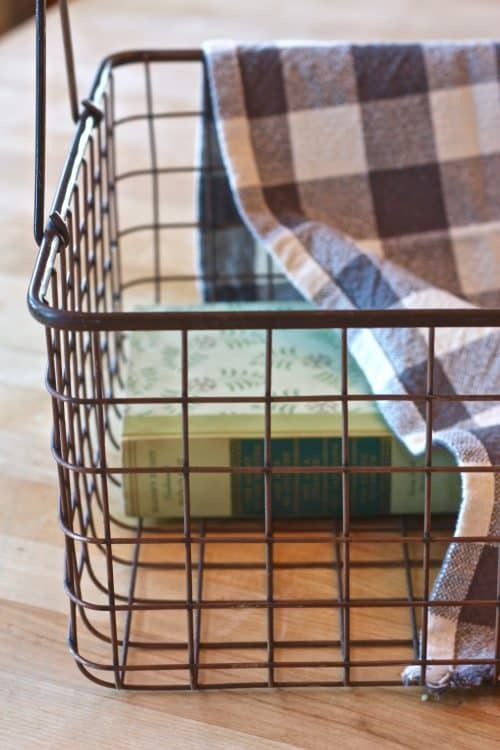 I also added an old book in the basket that will be hidden under the plaid dishcloth that will serve as a riser for the dish and the cookbook. Otherwise they would sit too low and not been seen as well. 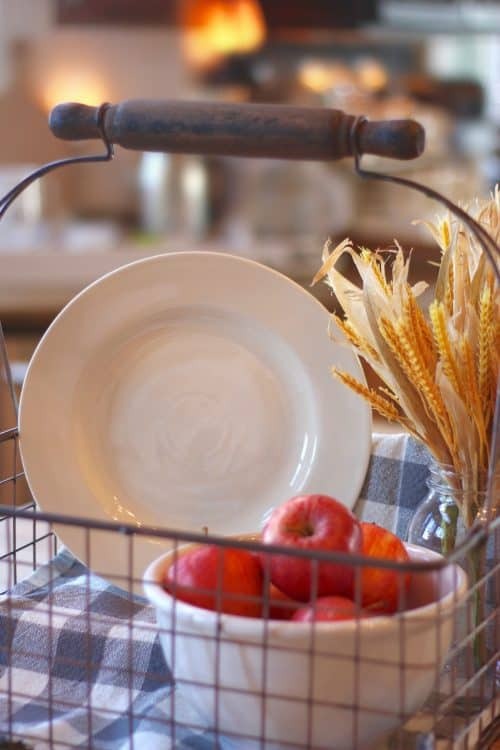 The plaid dishcloth will warm up the wire basket and it’s something I already had. 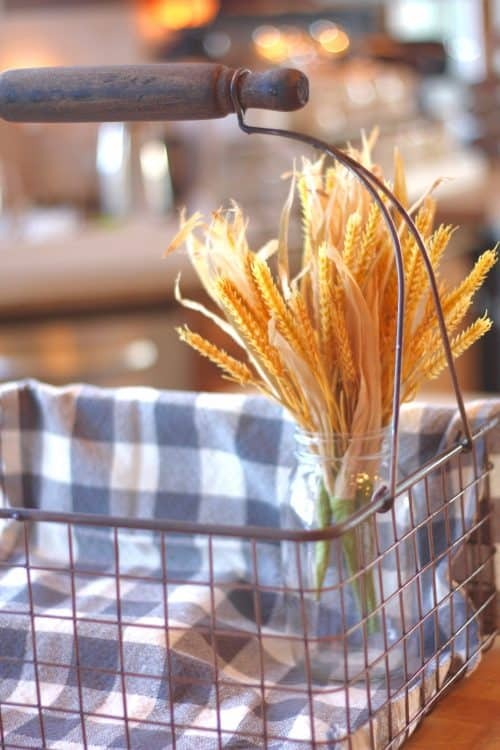 You could use a vintage tablecloth or a pretty piece of fabric too. As you can see, I covered the old book with the dishcloth and added the jar of faux wheat. Any fall foliage will work. 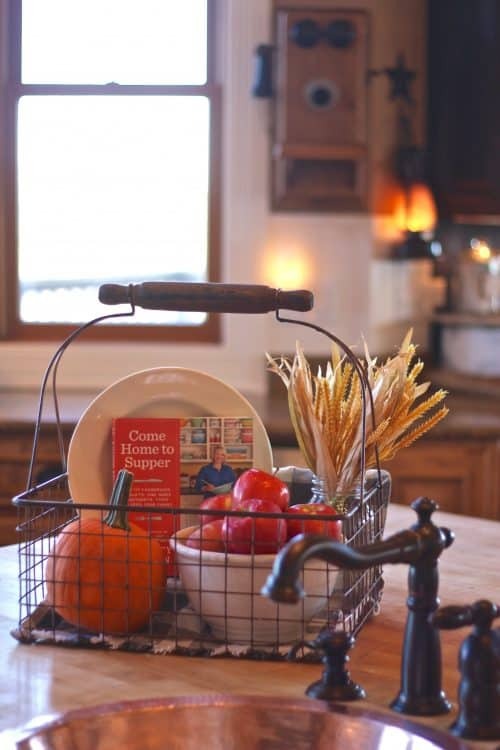 Then I placed the dish in the back (on top of the hidden old book) and placed the bowl of fresh apples in the front of the basket. 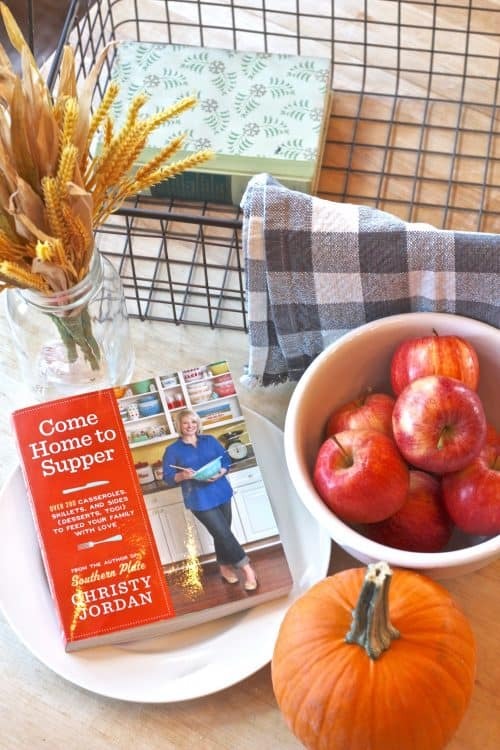 Lastly, I added the pumpkin and Christy’s Come Home to Supper cookbook. As you can see, the items I chose match the colors on the cover of the cookbook. That’s what really ties everything together. There you have it! 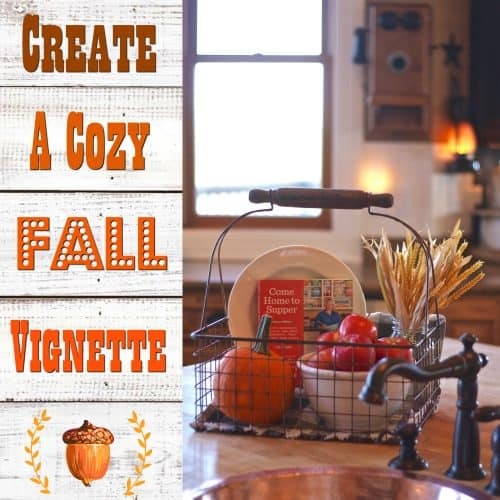 Easy peasy and cozy fall vignette! Now when I’m chopping vegetables for supper I have something beautiful to look at! And that’s a good thing because beauty inspires and makes our heart happy! Let’s put the “Sweet” back in Home, Sweet, Home! Get to know Aunt Ruthie below, you’ll be glad you did! Howdy! Meet Aunt Ruthie from the Ozark hills of Branson, Missouri. She’s a happily married mama of four and “Honey” to eight grand babies. 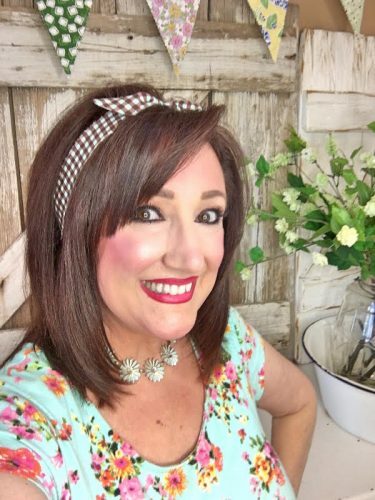 Ruthie’s co-authored four books on home and family with Harvest House Publishers and has been blogging for 10 years at Sugar Pie Farmhouse. 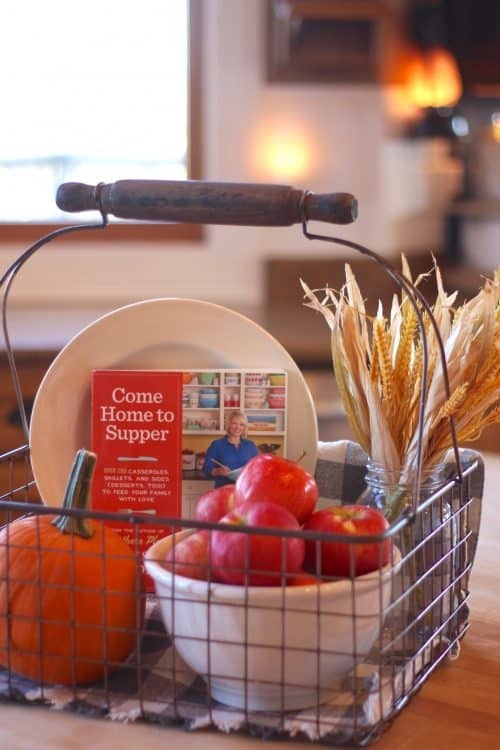 Her blog is where you’ll find ideas to help make your home as sweet as Sugar Pie! Love this! Now I know what’s going on the green table I just moved into the kitchen! That is so easy. TY for the post and the links.